Whether or not you enjoy a virgin Bloody Mary, or a fully-loaded one, capping it with a Grilled Cheese Topper only makes it better. It may sound weird, but it beats a bowl of stale peanuts or boring old potato chips. I mean, there’s an actual melt-in-your-mouth grilled cheese sandwich complete with bacon on your drink, and, because it’s part of your typical morning cocktail, an olive. 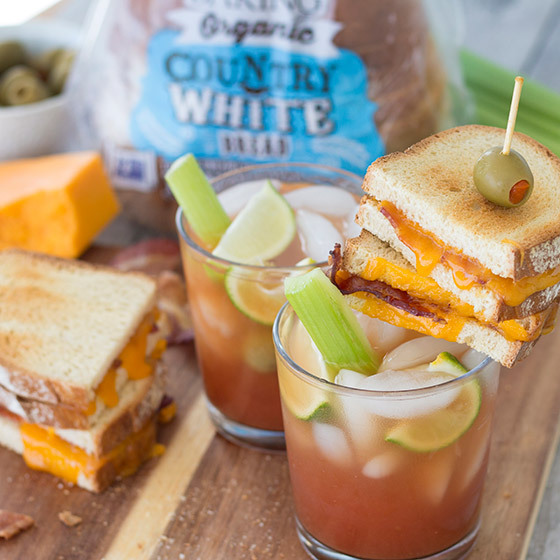 A Bloody Mary with Grilled Cheese Topper may seem indulgent, but not when you’re using our “eat-with-anything” Organic Country White Bread. Highly recommended for cocktail-topping sandwiches, and just about anywhere else delicious bread is needed. Do not operate heavy machinery after enjoying this treat, but do invite a few friends and have an impromptu party. Cook bacon according the package directions. Remove from skillet and place on paper towel-lined plate to drain. Butter one side of each bread slice. Heat a large skillet over medium heat. Place two buttered slices of bread, butter side down, in skillet and layer each with three Cheddar slices and three slices of bacon. Top each with remaining slices of buttered bread, butter side up. Cook for 1 minute, then carefully flip sandwiches. Cover skillet with a lid and cook 2 minutes longer. Remove lid, flip sandwich, cover and cook 2 more minutes. Remove lid, flip sandwich and, if bread is sufficiently golden and cheese melty, transfer to cutting board to rest before cutting in half to garnish Bloody Marys. If more cooking time is needed, continue flipping and browning until done to your liking. Then use to garnish Bloody Marys. Divide tomato juice, vodka, hot sauce, Worcestershire sauce, salt and pepper among two glasses. Fill two more glasses with ice. Pour mixture into glasses with ice, then transfer back to original glasses. Repeat this process 3-4 times to mix well, ending with mixture in glasses with ice. Squeeze lime juice into each Bloody Mary and garnish with celery stalks, and skewered olives and grilled cheese sandwiches!